Create a very special gift when you sew a stuffed friend for someone with one of these doll sewing patterns. Choose from a range of skill levels, doll styles, and price tags (including many free patterns). Many of the designers in this list make other dolls too, so check out their blogs and shops for more fun sewing projects! 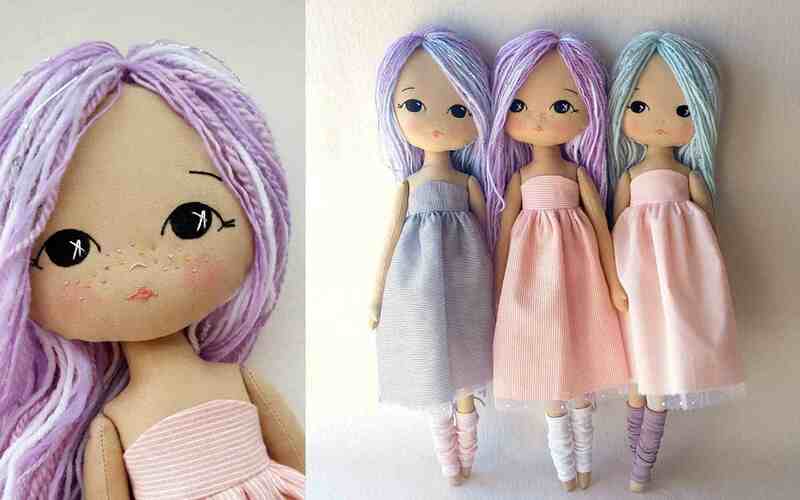 These aren't your traditional fashion dolls, but they are very stylish. Designed by Gingermelon, the 17-inch dolls look so pretty and come with patterns for the accessories shown in the photo. You can also buy patterns for more clothes for these dolls. Kids would enjoy these, but they're so cute that you might decide to make a set for yourself! Abby from While She Naps created this free small doll pattern to contribute the dolls to a fundraising project. You can make each one different and once you get the hang of it, they come together quickly. Be sure to check out Abby's other stuffed toy patterns, including her fleece family of dolls! This little baby doll is perfect for a very young child. Plus it's easy to sew without any arms or legs. It stays all bundled up in it's attached blanket! Instead of relying on a pattern, this doll comes together with a few measured out pieces and a bit of simple shaping. There's something magical about a mermaid, so who wouldn't want a mermaid doll to carry with them? The seashells and sweet hair buns look adorable on this doll. Add a few more details to the tail with embroidery or a fancy fabric! One kind of doll that you don't often think about when sewing is Matryoshka or Russian nesting dolls. This adorable free pattern doesn't make dolls that actually nest, but they do look like the real deal! The large dolls have an authentic shape and while the small ones are more on the flat side, they're still cute! A lovey is a cross between a small blanket and a stuffed animal or doll. They're comforting to little ones because they're easy to cuddle with. These little loveys have a star-like shape and a gnome hat. Although the samples are all one color, the assembly allows you to make the face and hat in a different color, which would also be cute! Your child will treasure this precious little baby doll pattern from Nimble Phish for years to come. Use fleece to give it a soft texture that's delightful to snuggle. The construction lets you pose this doll so it looks like a real baby. Plus, it has a tiny belly button! Jennifer from The Craft Patch shows a brilliant way to sew this simple felt doll together. The result is a more two-dimensional doll with flat, paper-doll-like clothes. You can even have your child help design new outfits for their doll! Keep this sleepy little baby doll in your pocket for those times when your child needs some entertainment or comfort. It's all cozy and cute in tiny sewn-on pajamas! In addition to this free pattern, designer Wendi Gratz also has a great collection of Dress-Up Bunch dolls in her shop. Rather than placing a tooth in a tiny pillow, have your child slide their lost tooth into the pocket of this tooth fairy doll! Even when they aren't expecting a dental-related reward, this is an adorable doll that they can play with and enjoy. This lovey doll has more blanket surface than some, but it's in the form of a baby onesie! Items like this often get a lot of love and children get attached to them. To prevent tears at laundry time, make a few loveys so you can rotate them! Waldorf dolls have shaped faces, achieved by creating a wool base with a knit fabric over the top. This simplified Waldorf doll comes to you in a series of posts. Start with this link below and let it walk you through the process! There's no need to choose between a princess or a unicorn with this doll. She's a unicorn princess! This hand-sewn felt doll pattern comes with pieces to dress up your tiny doll with a crown or a unicorn hat. Looking for another style? Noia Land offers hundreds of kawaii patterns! Does your tiny dancer want a doll to dance with? Sew them a ballerina doll! This free pattern has some great details, including arms perfectly shaped for holding ballet poses! Sew these sweet siblings with a detailed pattern from Retro Mama. The 18-inch doll pattern is best-suited for intermediate sewers and includes full photo-tutorials, plus tips and tricks, and customizable pieces. There are so many ways to change up the style! In Denmark, "hygge" is a warm and cozy kind of thing, and that's what this doll is all about. The free pattern shows you how to make the doll as well as how to knit her sweater. Want to make more? This is one of 8 free world doll patterns from designer Martha Moger. This free pattern for a tiny baby doll has a Waldorf-style sleepy face and a cozy little body. Designer Christina Platt recommends making the body and hat from a recycled wool sweater and adding a little lavender inside for an extra sleepy effect. 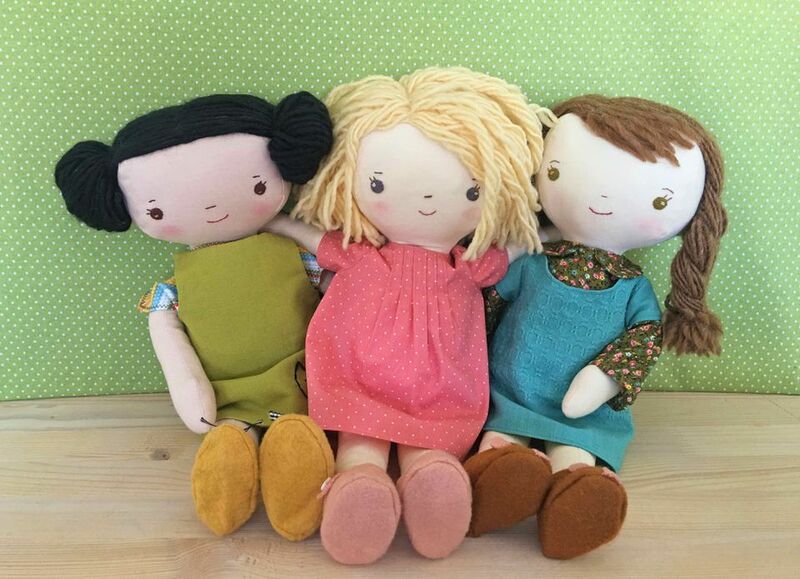 This trio of friend dolls can wait for you to sew them up so they can play together! In addition to the 16-inch doll pattern with three hairstyles, you can also sew them a small wardrobe of clothes to share! Use your hand sewing skills to make these posable felt dolls! At just 4 inches tall, they're the perfect size to go in a dollhouse, and with a bit of imagination, you can craft all kinds of accessories for them. Are these the cutest stuffed baby dolls you've ever seen? This pattern set from Dolls and Daydreams includes two sizes of baby dolls. There's even a bonus pattern for a baby sling so other dolls can hold the tiny baby! Your little superhero will love this doll, especially when they help customize it with fun fabric choices! You could even make this free pattern to look like your son or daughter. All you need to do now is create a superhero name!